As early as the mid-1940s, housing was scarce in Dallas as well as in other centers of defense production and military activity throughout the nation. The private housing industry was unable to keep up with the demand for shelter in these areas. Some federal officials saw the situation as an opportunity for experimentation in architecture and planning, as well as establishment of a pilot program aimed at lowering the cost of quality housing through the use of prefabrication and mass production building techniques. Defense housing officials also wanted to introduce industrial workers to mutual home ownership as an alternative to traditional suburban home ownership. 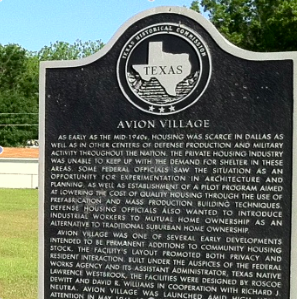 Avion Village was one of several early developments intended to be permanent additions to community housing stock. The facility’s layout promoted both privacy and resident interaction. Built under the auspices of the Federal Works Agency and its assistant administrator, Texas native Lawrence Westbrook, the facilities were designed by Roscoe DeWitt and David R. Williams in cooperation with Richard J. Neutra. Avion Village was launched amid high media attention in May 1941 as two teams of workers raced to complete the first house in the planned 300-unit development. The first unit was built in less than one hour. The entire development was finished in 100 days with the help of an on-site makeshift prefabrication plant. Civilian employees of the North American Aviation Company were the first to live in the complex. The Avion Village Mutual Housing Corporation purchased the development from the federal government in 1948. Avion Village continues to be mutually owned by residents.